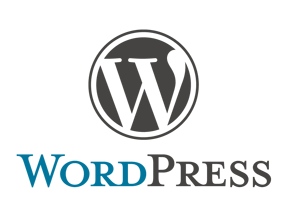 WordPress continues to be a dominant content management system. Nearly every WordPress site relies on plugins for added functionality. But with the overwhelming number of plugins, it’s difficult to know which are the best. I’ve done some of the work for you, selecting seven of the best plugins released this year. 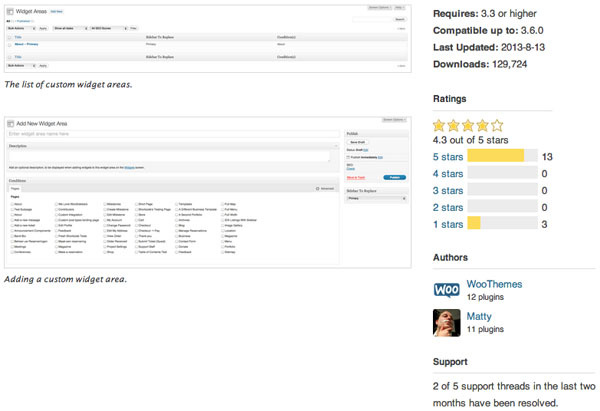 The plugins in this list each have at least a few thousand downloads, and at least five reviews with an overall score no lower than 4 out of 5 stars. Schema.org is the structured data markup language recognized by Google, Bing, and Yahoo. These schemas give the search engines more information about your page. As Google, especially, continues to add new ways of displaying search results, website owners should provide Google with structured data to help — in the form of rich snippets. One of the best rich snippets is the star rating that appears in some search results, which can give your site a higher click through rate. Applying the schemas to your site can be tricky. Even though there are helpful tools such as Schema Creator, the task can be difficult. This plugin adds options to every post, page, and product page that makes it easy to add Schema.org markups with no hassle. Every so often a unique and gorgeous social media plugin will emerge. The Metro Style Social Widget plugin is a good example. This lightweight plugin adds links to your social profiles in your sidebar or other areas of your site. The default profiles are Facebook, Twitter, Google+, and RSS. But you can add YouTube, Pinterest, and LinkedIn as well. The plugin will always display Facebook and Twitter, but the rest of the social profiles can be easily removed with the display retaining its beauty. WooSidebars solves a common problem of needing a custom sidebar for specific pages, not just page types. Many WordPress themes come with a few different sidebars for different page types, such as the main, page, post, and product pages, but the customization often stops there. WooSidebars is more granular and allows you to target as many specific pages as you want to create custom sidebars for every page. This plugin works on any theme with dynamic sidebars. Download speed is increasingly important. It is part of Google’s ranking algorithm. There are tools to measure speed and offer recommendations. 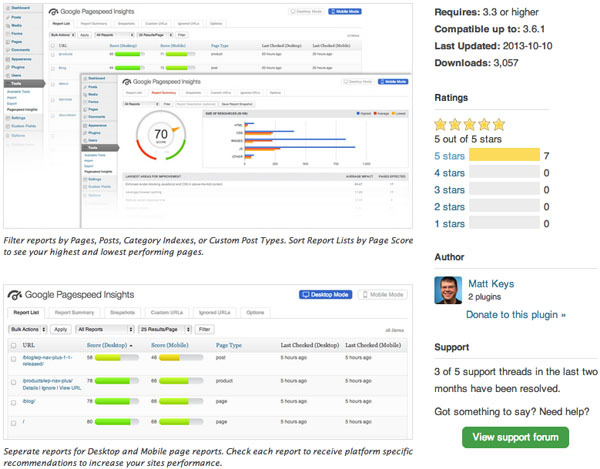 But the Google Pagespeed Insights plugin provides page-by-page speed recommendations right from the WordPress admin. 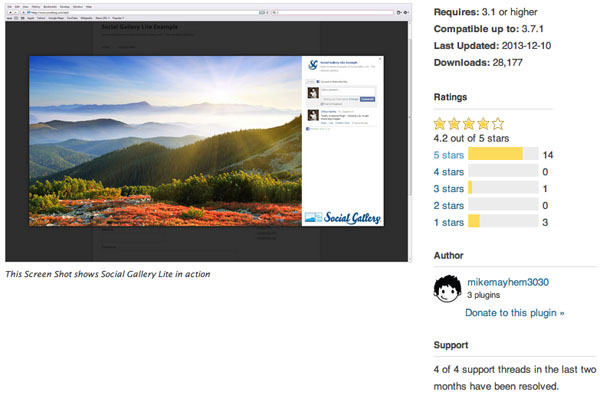 The Social Gallery Lite plugin takes a standard image lightbox and makes it social-media ready, with comments and sharing capabilities on the side of the image. This plugin can boost the sharing of your photos and increase traffic to your site from Facebook. The lightbox is similar to the Facebook lightbox, with Likes and comments. Users will therefore have a familiar interface to work with. This plugin is best for photographers or other businesses with high quality images that are likely to be shared on social media. The Google Analytics Dashboard for WP is the best I’ve seen for displaying visits, visitor locations, top pages, and top keywords reports right from your main WordPress dashboard. 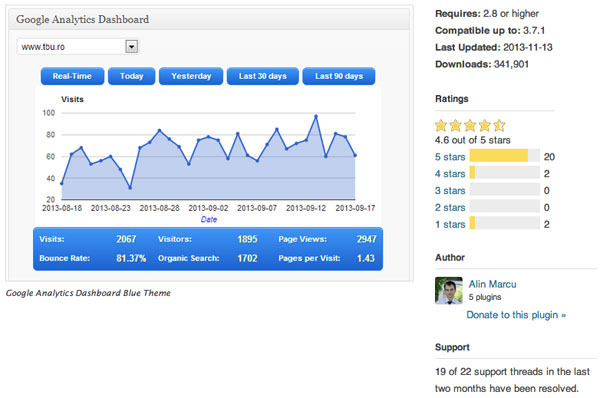 This plugin shows how a site is performing without logging into Google Analytics. 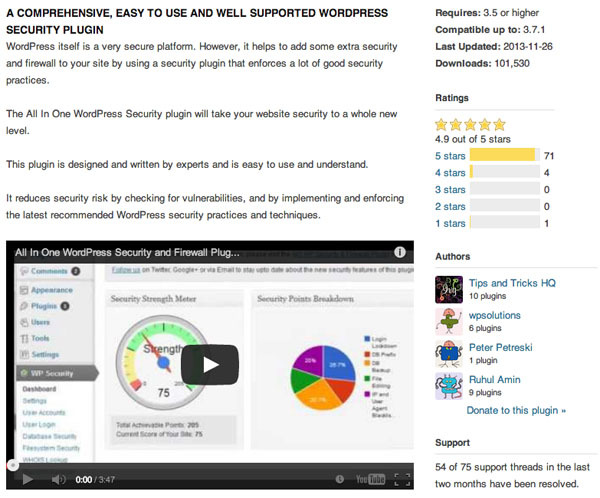 This plugin provides an easy-to-read dashboard showing the security levels of your WordPress site, and recommends best practices to increase security. It ranks security threats by potential damage to your site. This plugin is powerful enough to make your site more secure, but simple enough to make it easy to configure. It includes .htaccess, wp-config, and database backup functionality to protect the most important files. 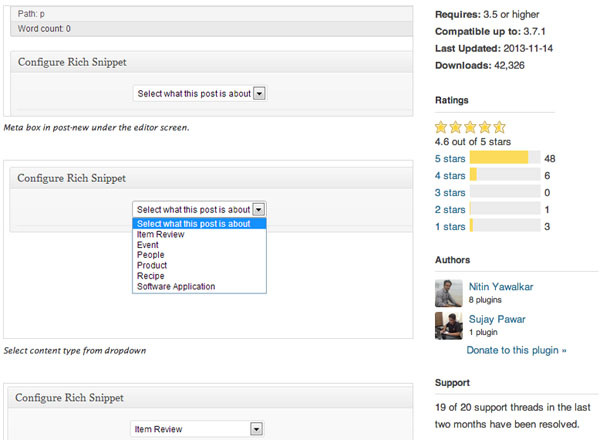 The plugin also monitors where spam comments are coming from by their IP addresses.